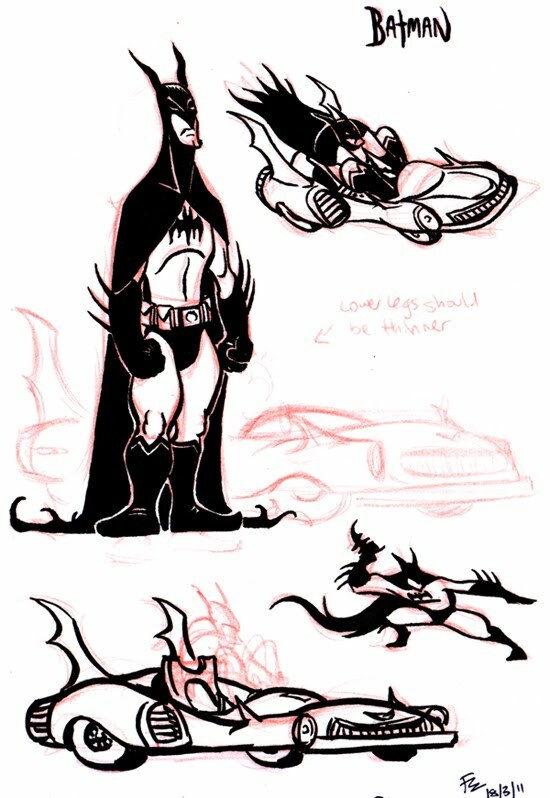 Character design practise using Batman and his Batmobile. Batman and his car are, of course, property of DC comics. The aim of this practise is an exercise in creating a strong unique design for a character, particularly focusing on the use of shapes and contrast (in size, shape and lines). This piece of work has some influences from Nico Marlet, the extremely talented character designer for Kung Fu Panda, How to Train Your Dragon, Bee Movie, etc. He loves using red pencil and ink/markers over them. The Art of Kung Fu Panda is filled with Nico's sketches (and there are tons of them!) and worth every dollar. I love how the Batmobile is so small and it forces Batman to tuck in his knees in order to get in. Reminds me of bumper cars! Drawn in Col-Erase red pencil and inked with a felt-tip calligraphy brush pen.